Ski resorts are adding zip to their attractions, literally. No longer are ski resorts just about skiing or snowboarding – you can fill a day of fun at a ski resort without ever strapping on skis. 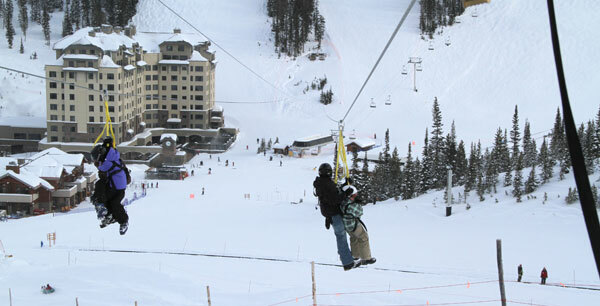 Zip Lines are the biggest addition at ski resorts across the country. Less expensive to install than a new lift, these series of cables that connect from tree top to tree landing deck offer a unique experience as you are harnessed in and attached to the zip cable for your descent of the mountain. Some zip lines have hand brakes you operate yourself, others have built in braking mechanism. Either way you can reach decent speeds during your descent. You are required to wear a helmet on zip lines, the safety protocol includes training and often a practice zip before you hit the big cable. Check out Maine Zip Lines at Sunday River and Sugarloaf. New Hampshire Zip Lines are offered at the following ski resorts: Attitash, Loon, Cranmore and Gunstock – with the longest span in the US, until Attitash debuted its ZipTour at 5,000′. Bretton Woods’ Canopy Tour has 10 zip segments. Wildcat’s Zip Line does not operate in winter. You will find Vermont Zip Lines at Smugglers Notch, Bromley, and Sugarbush. Mountain Coasters are another attraction – like a roller coaster that descends tracks on a ski slope. Mountain Coasters can be open summer and winter, the cars run on metal tracks, which typically sit two small people or a parent and child, or one large adult. You have your own brake in your coaster car to control your speed. Vermont’s only Mountain coaster, for now, is at Okemo, called the Timber Ripper. Okemo’s Mountain Coaster is located at Jackson Gore’s base area. Okemo also has a 7 zipline circuit experience that is really fun, full of exciting descents, high tree platforms and a few belays, at their alpine adventure center. In Quebec, Rodeling at Le Massif is a fun crazy alpine adventure, sledding down 4.5 miles of a groomed natural snow trail on a traditional wooden runner sled – rodel, over 2,400-vertical feet at speeds of up to 50 mph. We don’t think this wild Canadian sled ride would fly in the US, so go to Le Massif for serious sledding! In Oregon, snowmobiling in The Deschutes National Forest near Mt Bachelor Ski Resort is a great après ski adrenaline activity. A two hour snowmobile tour takes you out on a ski doo to explore over 280 miles of trails and 250,000 acres of wildlife, snowfields, and hills with amazing scenery of the volcanic peaks of Mt Bachelor, The Sisters and Broken Top. In summer, many ski resorts continue to offer ziplining and mountain coasters plus they add to the excitement with mountain biking and hiking with lift service. See our review of Sunday River’s mountain bike park and the Sunday River North American Wife Carrying Championships held in the fall. Expect to see more ski area zip lines, adventure courses, and mountain coasters in the U.S. and Canada particularly at ski resorts and amusements parks They are hugely popular in Europe, over 6,000, and growing fast here in the states. At $10- $100 a pop depending upon the time, distance traveled and lift access, it’s a thrill that will put some zip in your skip.